Maheshwar in Madhya Pradesh, India is known for its exquisite and finely woven Maheshwari fabrics. 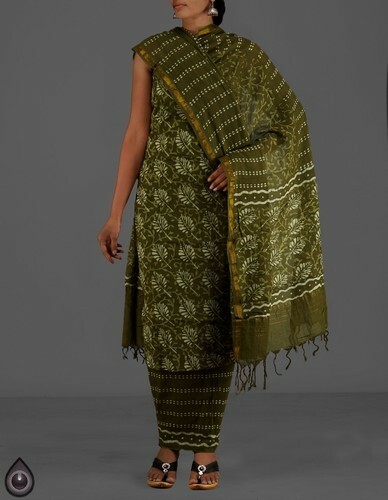 The Maheshwari Salwar kamizare exclusive for their unique designs on silk and cotton with a fine use of zari. Distinctive features of theMaheshwari cotton salwar suit are the light weight, shiny lustre, and a fine display of colours, with brilliant motifs on the kameez, and an attractive dupatta to match. The chudidar kameez is known for its brilliant display of stripes, checks and exquisite floral borders with complementary contrast borders and tantalizing wide zari borders.